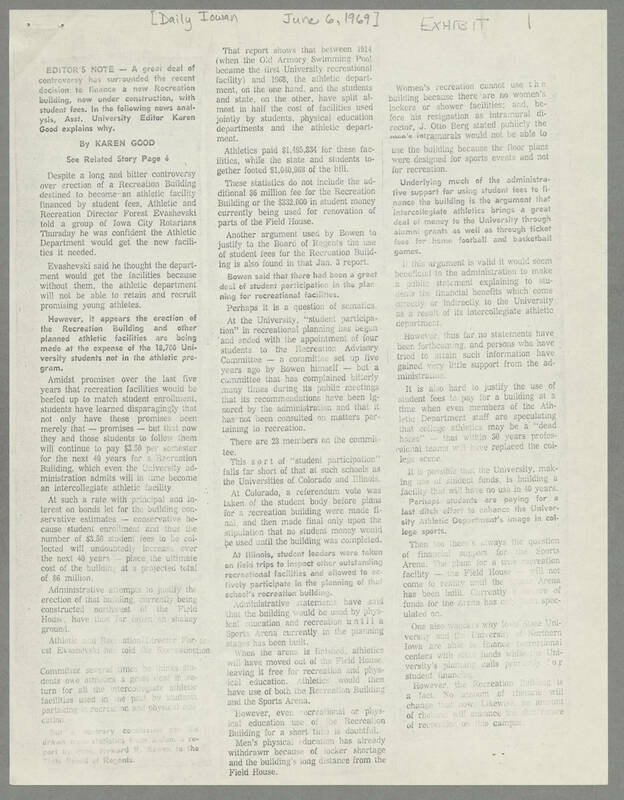 [ Daily Iowan June 6, 1969] EXHIBIT 1 EDITOR'S NOTE - A great deal of controversy has surrounded the recent decision to finance a new Recreation building, not under construction, with student fees. In the following news analysis, Asst. University Editor Karen Good explains why. BY KAREN GOOD See Related Story Page 6 Despite a long and bitter controversy over erection of a Recreation Building destined to become an athletic facility financed by student fees. Athletic and Recreation Director Forest Evashevski told a group of Iowa City Rotarians Thursday he was confident the Athletic Department would get the new facilities it needed. Evashevski said he though the department would get the facilities because without them, the athletic department will not be able to retain and recruit promising young athletes. However, it appears the erection of the Recreation Building and other planned athletic facilities are being made at the expense of the 18,700 University students not in the athletic program. Amidst promises over the last five years that recreation facilities would be beefed up to match student enrollment, students have learned disparagingly that not only have these promises been merely that - promises - but that now they and those students to follow them will continue to pay $3.50 per semester for the next 40 years for a Recreation Building, which even the University administration admits will in time become an intercollegiate athletic facility. At such a rate with principal and interest on bonds let for the building conservative estimates - conservative because student enrollment and this the number of $3.50 student fees to be collected will undoubtedly increase over the next 40 years - place the ultimate cost of the building at a projected total of $6 million. Administrative attempts to justify the erection of that building currently being constructed northwest of the Field House, have thus fallen on shakey ground. Athletic and Recreation Director Forest Evanshevski has told the Recreation Committee several times he thinks students ow athletics a great deal in return for all the intercollegiate athletic facilities used in the past by students partaking in recreation and physical education. But a contrary conclusion can be drawn from statistics from a Jan 3 report by Pres. Howard R. Bowen to the State Board of Regents. That report shows that between 1914 ( when the Old Armory Swimming Pool became the first University recreational facility) and 1968, the athletic department, on the one hand, and the students and state, on the other, have split almost in half the costs of facilities used jointly by students, physical education departments and the athletic department. Athletics paid $1,495.334 for these facilities, while the state and students together footed $1.040. 968 of the bill. These statistics do not include the additional $6 million fee for the Recreation Building or the $332,000 in student money currently being used for renovation of parts of the Field House. Another argument used by Bowen to justify to the Board of Regents the use of student fees for the Recreation Building is also found in that Jan . 3 report. Bowen said that there had been a great deal of student participation in the planning for recreational facilities. Perhaps it is a question of semantics. At the University "student participation" in recreational planning has begun and ended with the appointment of four students to the Recreation Advisory Committee - a committee set up five years ago by Bowen himself - but a committee that has complained bitterly many times during its public meetings that its recommendations have been ignored by the administration and that it has not been consulted on matters pertaining to recreation. There are 23 members on the committee. This sort of "student participation" falls far short of that at such schools as the Universities of Colorado and Illinois. At Colorado, a referendum vote was taken of the student body before plans for a recreation building were made final, and then made final only upon the stipulation that no student money would be used until the building was completed. At Illinois, student leaders were taken on field trips to inspect other outstanding recreational facilities and allowed to actively participate in the planning of that school's recreation building. Administrative statements have said that the building would be used by physical education and recreation until a Sports Arena currently in the planning stages has been built. When the area is finished athletics will have moved out of the Field House leaving it free for recreation and physical education. Athletics would then have use of both the Recreation Building and the Sports Arena. However, even recreational or physical education use of the Recreation Building for a short time is doubtful. Men's physical education has already withdrawn because of locker shortage and the building's long distance from the Field House. Women's recreation cannot use the building because there are no women's lockers or shower facilities; and before his resignation as intramural director, J. Otto Berg stated publicly the men's intramurals would not be able to use the building because the floor plans were designed for sports events and not recreation. Underlying much of the administrative support for using student fees to finance the building is the argument that intercollegiate athletics brings a great deal of money to the University through alumni grants as well as through ticket fees for home football and basketball games. If this argument is valid it would seem beneficial to the administration to make a public statement explaining to students the financial benefits which come directly or indirectly to the University as a result of its intercollegiate athletic department. However, thus far no statements have been forthcoming, and persons who have tried to attain such information have gained very little support from the administration. It is also hard to justify the use of student fees to pay for a building at a time when even members of the Athletic Department staff are speculating that college athletics may be a "dead horse" - that within 30 years professional teams will have replaced the college scene. It is possible that the University , making use of student funds is building a facility that will have no use in 40 years. Perhaps students are paying for a last ditch effort to enhance the University Athletic Department's image in college sports. Then too there's always the question of financial support for the Sports Arena. The plans for a true recreation facility - the Field House - will not come to reality until the Sports Arena has been built, Currently a source of funds for the Arena has only been speculated on. One also wonders why Iowa State University and the University of Northern Iowa are able to finance recreational centers with state funds while the University's planning calls primarily for student financing. However, the Recreation Building is a fact. No amount of rhetoric will change that now. Likewise, no amount of rhetoric will enhance the dim future of recreation on this campus.